KONGSHENG POWER DRAW HARMONICAS X 5 KEYS OF C,D,LF,G,A - SANITIZED. USED LESS THAN 1 HOUR - BACKUPS TO MY SEYDELS. Condition is Used. Shipped with USPS Priority Mail. New ListingSuzuki Promaster Harmonica Key of F - New with gaskets installed! Free Shipping! New Suzuki MR350 Promaster Diatonic harmonica in the key of F, Teflon gaskets added for improved air tightness and response. Excellent harmonica! Hard case and instructions included. When he tests a harmonica he puts it through the 'paces' to make sure it plays excellently at all levels. Whether you’re a beginner or advanced, the Blues Harp is the harp for you. Doussié wood comb. Great response and tone for Playing the Blues. Stainless steel covers without side vents. Free Tech Support. Johnson Blues King Harmonica - Single Harp. The Blues King harmonica has a professional sound from brass reeds that are recessed into its shell. This prevents air leaks and allows for generous note bending. Nice but well used Hohner MS Blues Harp that has been cleaned, sanitized and is ready to play. Fine scratches on body and painted lettering on the comb is worn to a point that it's hard to read. Suzuki Promaster Hammond Harmonica HA-20 Beautiful Harp-Pick a Key-Some on Sale! 5 out of 5 stars - Suzuki Promaster Hammond Harmonica HA-20 Beautiful Harp-Pick a Key-Some on Sale! 2 product ratings2 product ratings - Suzuki Promaster Hammond Harmonica HA-20 Beautiful Harp-Pick a Key-Some on Sale! These harmonicas feature Brass Reeds, Plastic Bodies and Stainless Steel Covers. All you need to start playing Blues, Rock, Country or Folk! 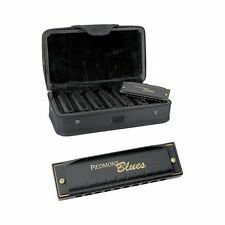 7 Harmonicas in a sturdy case; Keys of G, A, B♭ ,C, D ,E, F.
Hohner Blues Band 7 Key Harmonica Set. 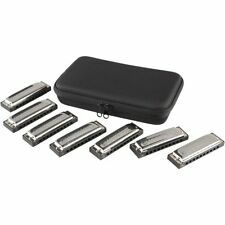 7 Key Harmonica Set with case. Give any musician the key they need to be a successful harp player. 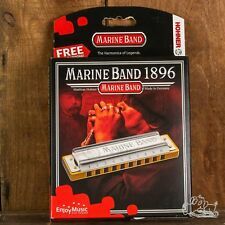 Harmonicas in the keys of A, Bb, C, D, E, F and G. We strongly suggest that you check your order after receiving it to be sure that it is in proper working order. Hohner Bluesband harmonica 7 piece set with carrying case.